The site, at 300 North 1st East, Green River, Wyoming, had previously been the city cemetery, which had been established in 1892. In 1926, a federal CWA project moved the bodies and old grave markers to the Riverview Cemetery just up the hill. 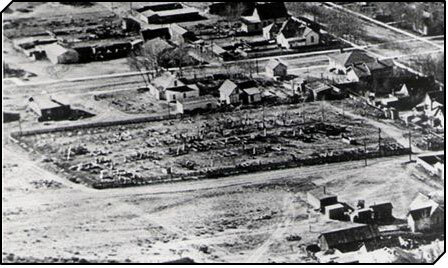 In 1930 the town used the site as a park.During 1944 a Veteran’s Housing Site was built on the site, due to the return of the veterans. During the construction, several remains were found and re-interned at the now current Riverview Cemetery. The identity of the remains was unknown. In 1989 “Ghosts on the Range: Eerie True Tales of Wyoming” by Debra D. Munn was published. Included in her book was the story of the Sweetwater County Library, titled “The Library Built over a Cemetery”. Ms. Munn was good enough to come to the library the following Halloween and do a reading from her book. Story has it that several loud noises were heard from the stage area and eager listeners reportedly wondered out-loud if the “ghosts” were upset about the reading. In 1993 a “Ghost Log” was started to record the unusual happenings. As something unexplained happened it was written in the log. The log is available at the Circulation desk, but is not available for check out. 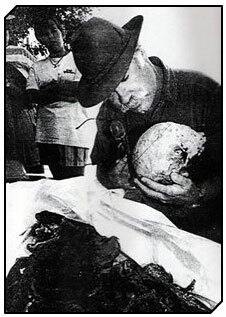 Charlie Love, from Western Wyoming Community College, examines a skull found in front of the Sweetwater County Library. During pipeline construction in August of 1996 remains were unearthed just outside the library by the lower parking lot. Sweetwater County Coroner Dale S. Majhanovich said wood chips were found Tuesday by construction workers digging under North First East. Charlie Love, of the Western Wyoming Community College Archaeological Services Department, examined the find and determined that the bones were of two people. Two wooden coffins and their contents were within a couple feet of the pipeline that was being worked on and one coffin had actually been nicked when the line first went in. At least one of the wooden coffins was covered in felt with a small window. A brass plaque indicated the coffin was purchased a Beeman and Cashin Mercantile Co. of Evanston. No date was inscribed. It was determined one was a male about 45 years old and the other a female of about the same age. Both were in good health, at least one was Caucasian and both were about the same height The bodies were re-interred at the Riverview Cemetery. This log is still currently being used. It’s Quiet at the Library, or is it? Every now and then someone will approach the Front Desk at the library and ask “So have you had anything ghostly happen lately?” If I had a nickel for every time I hear that line. It is strange how at times things will be so quiet and then for no reason activity picks up. You just never know. We do our work and forget about all the paranormal stuff and the next thing you know a patron is telling us they saw a door move in the Men’s Room. It never fails to amaze me. I joke all the time that the “ghosts are on vacation” when reports slow down. It does seem that they might just do that. According to one of my co-workers we have had two reports this week. The first was the gentleman that did report the door moving in the Men’s Room. 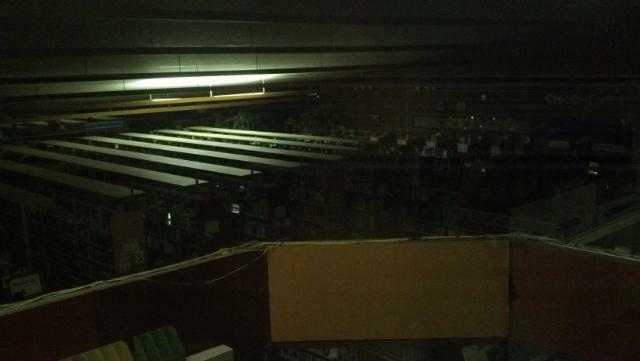 The second was someone claiming they saw a shadow moving along the back of the stacks. I always find the report of the shadows or shadow people interesting. I have seen them myself. The patron did not share much information so I am guessing a bit. When I have seen the shadows, it is very fast. It is so fast that you stop and think, “Did I see that”. Somehow I know I have, but after all these years I stop and wonder if my eyes are playing tricks on me. I am sure from time to time that may be the case, but I also know that there are times that is not the case. Many times we have been asked if there is a reason why the reports slow down. I have a couple theories on this. First I think we do receive reports but the patron has not written it down or emailed it in and we get busy with our everyday work and we forget to log it. Second, I think weather has a bit to do with it. When the weather is changing we seem to get more reports. If there is lightening, wind, etc. it appears to stir up the energy and thus the ghosts seem to work off it. This is the idea we use during Ghost Walks. By providing a battery pack and telling the spirits they can use it to come through, we seem to get better results. But like everything here, it is not always the case. As much as we would love to say YES we have all the answers, we do not. The paranormal world is now and I think, will always be a mystery. We try our best to understand what happens, what goes on, but alas we are still asking questions. One other question we are receiving lately is why we are not doing the May Ghost Walks this year. It is generally because of staffing. It takes several of us to do the Ghost Walks and we have a couple staff members that left the library. It has been decided that those positions will not be filled at this time. So as you see, some of the paranormal events will be scaled back just a bit. We will have our usual September, October and December events.